Have you ever heard of Jordan Smith? He was a contestant on the singing competition show "The Voice" a few seasons ago. I used to be a big fan of the show and I remember watching the episode when he auditioned. ALL the judges turned their chairs and were shocked because Jordan was not at all what they expected based solely on the voice they heard. But, hey! That's the whole premise of the show, right? Anyway, I liked Jordan because he represented something different. He wasn't trendy or strapping. He wasn't shy about performing "How Great Thou Art" or "Mary, Did you Know?" in front of millions. Best of all, he seemed completely comfortable just being himself. Based solely on looks, he was the underdog. But, then he sang and his voice was amazing. He went on to win that season in 2015 and last fall (2016), he released a holiday album. 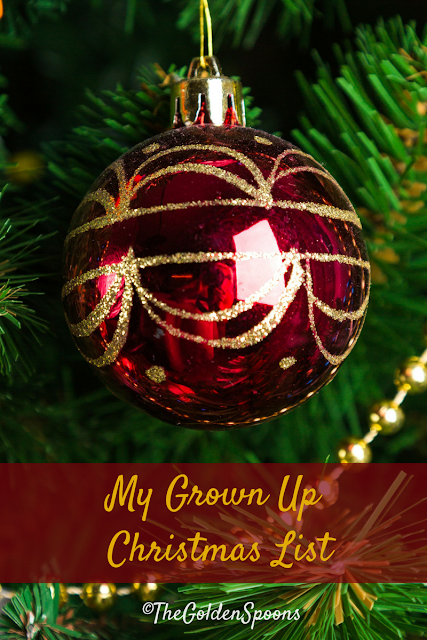 I downloaded it and heard the song, "My Grown Up Christmas List," for the first time. Have you ever heard it? I'm not sure where the song originated, but it has also been performed by Amy Grant, Kelly Clarkson, and Michael Bublè among others. It has become one of my favorite holiday songs, not only because I like the melody, but more so because of the message. As I listen to it, I imagine most of the adults I know would fill their own grown up wish lists with many of the same things . . . . . . Sounds pretty great, doesn't it? For my own wish list, I would add . . . .
Of course, if I really got to write up a list and send it off to the North Pole, I would have to ask that jolly old elf for a few, more selfish things, too. I would wish for . . . .
A special eraser to make middle school girl drama disappear A house cleaning fairy that appears whenever I snap my fingers A shopping spree at a few of my favorite stores A little more time and inspiration for blogging A little more time and energy to connect (or re-connect) with friends A parenting manual with all the answers I need for raising tween/teen girls A winning powerball ticket stuffed in my stocking! Ha! While some of those would certainly be nice (although perhaps unrealistic), the truth is, my life is overflowing with blessings. I think that, especially at Christmas, when we are bombarded with commercials and advertisements selling us all the gizmos and gadgets we don't really need, it's easy to lose sight of what we already have. The lyrics of this song remind us that there are more important things than just more "stuff." I hope that, this holiday season, you are surrounded by many blessings, too. I hope that you can take time to put the hustle and bustle aside and make a little room for peace, love, and joy. I hope that, if you are hurting, you will find healing. I hope that, if you are joy-filled, you will not take it for granted. I hope that you will laugh, smile, hug, and be hugged. I hope that you are safe, warm, and loved. Really liked your list, it is the inner qualities of life that really are the enduring gifts. (I also liked that, for whatever reason, used the word hope instead of wish...there is something more personal and substantial to one hoping for the best (for another) than merely wishing for it. And I am grateful I found the Golden Spoons! You know, that wasn’t really intentional, but now that you mention it, I agree. I do like hope better than wish. Thanks for the prompt & Merry Christmas to you, too! I love that song, too. Let's add no mean kids to that list of wishes. I am often reminded - stopped in my tracks - that while there are lots of things I would love to see happen in my life and in the world, what I already have is pretty damn great. May we never lose sight of that. Have a wonderful holiday! Beautiful, yes - this is a very good wish list. <3 All over and magic, too.